It’s a big day for people like me, that like keeping lists: We just launched a brand new version of TeuxDeux – the minimal calendar based to-do app that started in 2009 over a lunch conversation between Cameron and myself. For the past 6 months, Team FictiveKin, Jonnie Hallman and myself worked hard to bring you a completely revamped, better TeuxDeux. If you’re an existing user you will be happy to hear about our updates, as we integrated many of your requests! We made the site much, much faster and responsive. Try to resize that browser window over on teuxdeux.com and see what happens to the app in the top part of the screen. If you need a little bit of extra formatting, you’ll be glad to know we support Markdown, so you can make important words bold and links clickable. We’ve added recurring to-dos. If you’re worried about forgetting to water the plants, just write ‘every week’ after your to-do (i.e. water plants every week) and it shows up in your TeuxDeux. 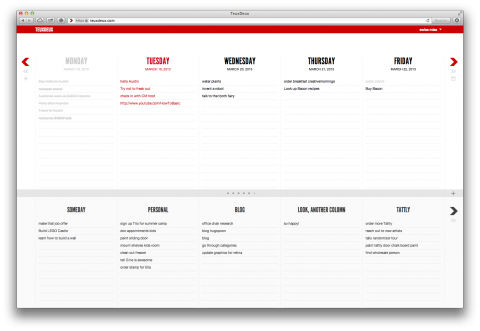 The Someday section at the bottom now allows for custom lists. Need columns for specific projects? Need a column for groceries? You got it. Add as many as you need and drag and drop to where you want them to be. Overall we tried to make TeuxDeux even easier to use and closer to piece of paper. Type in your to-dos right where you want them, move them around to suit your schedule, then click to mark them done. We’ve also added the option of downloading your data. Your to-dos are important, and we want to take good care of them. As I explained in an earlier blog post, with this new version, we are moving to a subscription model. We have seen too many startups close shop and shut down their product. We do not want to see any of this happen to TeuxDeux. We love the app too much and want to keep the lights on. Anyone can try the updated TeuxDeux for 30 days at no cost. And if you have purchased the iphone App in the past, you will get 6 months for free and if you have been an existing TeuxDeux user before our relaunch this weekend, you will get 3 months for free. Once your trial is over you have the option between $3 monthly or $2 if you pay for the year. Relaunching an app (plus iphone app) from scratch is a tad bit tricky, so we are experiencing a few issues with iOS logins for those folks that have special characters in their password or usernames. If you have a huge amount of to-dos, you might experience minor errors. We are on it. Reach out to our support [email protected] and we will take care of you asap. Or reach us on twitter @teuxdeux. The overhaul of @teuxdeux is fantastic. Glad to see they could improve upon an already-great product. Believer. @teuxdeux annual subscription purchased. Terrific UI updates to the app I use every day. There’s no service I’d be happier to pay for than @teuxdeux. It’s the To-Do list of my dreams and my world would implode without it! Simply brilliant. A long time coming but worth the wait. Certainly the best teux-deux app for me. My only feature request would be an option to disable automatically pushing items to the next day. I actually use the daily lists as a calendar for recording events, reserving the column lists for storing actual to-do items. I realize that they can be crossed out to do so, but it doesn’t seem like an intuitive action. Prefacing the item with an EVENT: or some such code so that the item stays on the day it is recorded could be a non-disruptive way to add this function to the interface. Please think about this because the strength of Teux-Deux for me is to use it as a calendar and a teux-deux app. Just to echo my tweet embedded above in the post, I’ve used it solidly for the past few weeks, initially reluctantly because every time I use a to do app it becomes a graveyard of hopeless intentions and procrastination. The killer feature of Teux Deux for me, which fixes this, is the sweep feature: it adds a layer of timeliness and urgency to your to do items which really does help, and is missing from other apps I have tried. That, plus it has the speed and nimbility (is that a word?) of a native app, so bravo to all involve. This review sounds like a paid advert but in fact I am *more than happy* to pay these guys $2 per month. If you don’t want to spend $2 on something you will use daily to make you more productive, then you have much bigger problems in your life that a to do app won’t fix. Just sayin’. The app looks great and as soon as you guys have an Android app I will be happily forking over the cash to use it! Been dying to use it since I first saw you guys start posting about it! Wonderful! I had downloaded the app a while ago, but never really engaged for consistent periods of time. I’m going to use this trial time to try to really use it. It really is a lovely site/app/tool. Really the only practical calendar based to do list. There are a few others out there, but adding a task on those requires filling in a cumbersome pop-up box for every new task. Google almost kind of had it with gtasks + gcal, but they never gave gtasks any love. The new TD features are great. I haven’t noticed an increase in speed though. If anything, it seems to hang a bit more (e.g., when completing a task) than the original version. It will be interesting to see if people are willing to pay at this price point. For example, Pandora is only $3/month, and they are providing hi-fidelity streaming and 60% of that fee goes to music licensing fees. So, by that standard, the TD price point seems high. On the other hand, sites like zen habits charge $10/month for access to video and text content. So, again, it will be interesting to see what happens. I loved the original one. I understand the need to charge to keep it going, but a monthly subscription seems too much. I don’t mind paying for it once, but continually?!? It’s not like new material is coming out every month. I can buy apps for one price that are way more complex than this and that are updated. Please consider a one time price and I would gladly buy this. Very cool refresh of a great service. Improved – not overdone. Is there a timeframe for the Android app? I’m disappointed at the utter lack of response to the dismal user reviews this update is having in the App Store. Obviously your users are VERY unhappy with the usability of this update. Maybe instead of posting a handful of all-positive reviews and ignoring the masses who are frustrated and lost without the app they formerly relied on (myself included), you could address the issues and when they will be amended? @L R – I’m the developer working on TeuxDeux for web and overseeing the development of the iPhone app. It kills me to see the app we’ve worked so hard on get horrible reviews, mainly from missing features that were in the old version. Your’e right—we should address it. But know that our initial response is to work around the clock to fix what’s wrong. To give you and everyone else some background, it’s been years since anyone has worked on the old version, and because of this, we needed to rewrite it from scratch or run the risk of breaking it completely—for all users, both iPhone and web. I also had to rewrite the web app and backend that supports both—I worked on these nonstop for the past 9 months. Rewriting the iPhone app took much longer than we had expected, so a number of features, including drag & drop to other days, had to wait for the next update. We spent the weeks leading up to launch making sure sync worked properly, believing we’d much rather have an app that syncs properly but misses the drag & drop feature, than an app that has drag & drop but it doesn’t matter because sync is so poor. This is our 1.0 and I promise you, the next update will fix just about everything that’s giving the current version such a bad rating. We want to make this a great app—we all use it religiously and know that so many others out there do too. Again, it truly makes me an emotional wreck to see the negative comments, but we’ll fix these issues. If nothing else, this makes one appreciate the execution of companies like Apple that frequently (but not always) combine 1) great design + 2) great functionality + 3) great proactive communication skills. It’s not easy to do all three. Thank you for the quick response and information on the status of the app, I know I appreciate it and other users will too. At the end of the day it’s just an app, but it’s a testament to the power of the TeuxDeux team that users feel so lost without the functionality you’ve built and the tool you’ve created for our daily lives. It’s helpful to know users are being heard, and thank you again for the feedback. It looks good, although I’m a poor student who switches between various to-do list/calendar systems (and uses android mostly) so I’m unlikely to pay. 1) as asked above, what’s the status of an android option? 2) you had mentioned an extended trial for those who bought the ios app – is that still true? how do I access that? I haven’t logged into my ios app since the update so that may answer my question. It will be interesting to see how this goes as the field of to-do list apps seems so crowded and this seems like a big jump from free or a one-time fee. I don’t think the app is worth $2 – $3/month to me so won’t be checking out the new version. I paid for the iPhone app and will likely buy another or get around to trying out the Reminders app included on the phone. I don’t have any real complaints about the app but it never became indispensable for me. @Rachel – We’re working with 3rd party Android developers to get them up to speed with the new version. In the meantime, the web app doubles as a mobile web app that you can save to your homescreen. Also, if you email jen [at] teuxdeux [dot] com, she can double-check that you get the extended trial. That is way too much to charge for a simple service like this. I am shocked you guys would do that to all your loyal followers!! Please do not charge so much. I can not afford the price structure. I think charging for this is a poor idea. Your charging now! WHAT! I cannot believe this. How awful! Why does it cost so much? I think you should not charge!!!! I for one will not pay, neither will my co-wokers. I feel betrayed. I think it is a bit pricey–I would be willing to pay between $5-10 for an annual subscription. Just found out about this app and give it a try. Very pleased with the simplicity of it and no distracting crap or weeks to figure out how to use it. Only change I would like to see is the option to leave the entry on the specific date and not automatically roll over. Like another user I used it to record delivery dates of items posted and the rolled over. Other than this I think it’s a great app and have no objection paying a yearly fee for this. We all need to eat. I LOVE TeuxDeux! And am really glad you are charging for it so it can thrive and improve and support you lovely people who made it. So I’m wondering…is there any possibility of having the option to toggle between subscriptions on the browser app? I mean the non-mobile one.. whatever that’s called. I am using it for my business and it’s SO great to be able to add things to my assistants’ lists on my phone and I would love it if I could easily pop between them on my desktop. Just a thought… and thanks for the great app! I’m often to be able to blogging i really thank you for content. This article has really mountains my attention. I am going to take a note of your site and make checking for brand new information. I’ve just found TD after a year of bloat with toodledo and this totally suits the way I work. But I just can’t believe people are carping about going without one coffee a month to work inside TD …. do these people go to work at their jobs every day for no pay? Crazy. How does anyone think that the TD team can continue to put their effort, time and finances into the continuing development of TeuxDeux – let alone the cost of hosting this site, blog and the customer database (that must be massive now) with no support from their user base? I’m happy with less than a dime a day for this amount of functionality, thanks for all your hard work. Hi, I do think this is an excellent site. I stumbledupon it ;) I am going to return yet again since i have book-marked it. select the right a bed that fits the unit. Other than that, I am very happy with our purchase two years later. Integrated motor and fan – If either one breaks you have to replace the whole thing. after being denied. Proving negligence is done through the evidence you provide with your claim. are responsible for the accident. Hello! I love the app on my phone and accessing it on the web – you mention making an Air app in the near future, but with enough begging would you please make an app/download for Windows 8, too? Hi, I’m trying out teuxdeux. Love it so far, but I’d love it even better if there was an android app similar to the iphone app. I tried the third party apps for teuxdeux, but theyare not very intuitive. Accessing the site on mobile works fine but still, there is no “home” link, in case you scroll through the week or the lists and you can not move tasks around. Are you planning to realease your own android app?